bottom of the unit) below. Congratulations and thank you for purchasing the Personal Mobile Tool. improper use, repairs, defects, battery replacement or any other cause. remaining lit at all times. the time you purchase this product. Operation Manual on the CD-ROM). use of this software, except for compensation required by law. • Java, PersonalJava and J2ME are trademarks of Sun Microsystems, Inc.
• Metrowerks and OpenPDA are trademarks of Metrowerks Corporation. • Linux is a registered trademark owned by Linus Torvalds. • Opera™ is a trademark of Opera Software ASA. • Hancom™ is a trademark of HancomLinux, Inc.
• Intel is a trademark or registered trademark of Intel Corporation. both models, otherwise the model name is used. Please refer to the appropriate manual as required. format on the accompanying CD-ROM. can view them on your PC after the software has been installed. your PC, click on the “Install Adobe Acrobat Reader™” from the menu screen. Copyright © 2003 Adobe Systems Incorporated. All rights reserved. Note: The AC power cord plug may differ in some countries. Note: Only use the “EA-BL09” rechargeable battery (supplied). 1. Attach the battery on the back of the unit. stylus pen before inserting the battery. replacement switch to the “ ” position. Note: Only use the “EA-70” AC adapter (supplied). cord to the AC adapter. • Charge the battery to its full capacity until the charge light turns off. • The AC power cord plug may differ in some countries. one time to open, select an item, etc. Zaurus after completing the battery charge. The Welcome screen will appear after a few minutes. Then, follow the next steps to complete the initial settings. (without AC adapter). Turn the power on, then proceed to the next step. adapter. Charge the battery to its full capacity. 1. On the Welcome screen, tap anywhere on the screen. The Calibration screen will appear. 2. Tap the cross hairs firmly one by one. Then, follow the next step. 1. Tap the Time Zone drop-down list button. Six city names will be displayed by default. 2. Select your time zone. 5. If you select the 12-hour format in step 3, select AM or PM by tapping the dropdown list. • Tap the up and down arrows of the year spinbox to set the current year. • Tap the month drop-down list button and select the current month. to change the setting month by month. Monday to begin the week. 8. Tap the Date format drop-down list button and then tap the desired format. 2004) will not be applied to some applications. The display will turn to the Edit Owner Information screen. using the Address Book application. Tapping “Back” will return the screen to the previous Set System Time screen. Note: You will not be able to select or enter the category name on this screen. power-on setting. You will be required to enter it every time you turn the Zaurus on. the Security application (See the Operation Manual on the CD-ROM). 1. Tap the “Set passcode” button. 2. Enter your passcode and then tap “OK”. 3. Enter the same passcode again and then tap “OK”. tap the “Require passcode at power-on” checkbox to turn it on. to complete the initial settings. Once the initial settings are completed, the Home screen will be displayed. correct passcode will display the Home screen. Next, install the software for your PC and the Zaurus from the CD-ROM. ports in the original configuration from the PC manufacturer. disable the power saving mode. card installed in a PCI slot. operate properly, perform the following steps. disconnect them from your PC. USB extension cable may result in the USB driver not operating properly. • Do not remove and connect the USB cable from/to the PC in a short time. an administrator account for the PC from the displayed screen, and log on. place, contact the administrator of the PC about an Administrator account. application” etc. can all be installed at one time. 2. Close all applications on your PC. 3. Insert the accompanied CD-ROM into your CD-ROM drive. A menu screen will be displayed automatically. instructed to do so by the software. 4. Click “Install PC Software”, then confirm the displayed contents and click “OK”. Installation of the software will begin. uninstallation screens will be displayed (See page 20). dialog box for uninstallation of the software will be displayed. 5. Follow the on-screen instructions and complete the installation. page 80), be sure to install the “Zaurus File Transfer” beforehand. • Other software files can be installed later (See page 20). when attaching or unattaching a USB device using Windows XP/2000. 6. When the installation is completed, reboot your PC. Next, connect the Zaurus to your PC. 9. Turn on the Zaurus. appears, follow the wizard until the USB driver is installed. 3 (WDM)” as its target hardware, and click “Continue Anyway”. Next, set the PC Link options on the Zaurus. 12. Tap the “PC Link” icon on the Settings Home screen. 13. Select “USB-I/O (default)” or “Serial” as the connection. You are now ready to use your Zaurus and the PC software. Panel (Or click the Start menu, then (All) programs → Sharp Zaurus 2 → Uninstall). on the Control Panel will uninstall the USB drivers. add and what software you currently have installed on the “Select the Software” screen. the software you want to delete on the “Select the Software” screen. Select “Remove” in the above screen and follow the on-screen instructions. The e-mail message can include attachments. PC. Data can be exchanged easily using the PC “drag-and-drop” operation. • The capacity to add applications by importing them from a PC etc. 1, 1970 (GMT) to December 31, 2037 (GMT). Allows you to store events and set alarms. of what needs to be completed and when to be done. Allows you to create and transmit e-mail messages. Allows you to view and edit Microsoft Excel files. Allows you to view and edit Microsoft Word files. allows you to edit Memo and illustration files. Allows you to record/play your messages and memos. Zaurus or from expansion memory cards. Offers help information similar to a web browser. the brightness of the backlight. Allows you to change the Startup and other sounds. both the EMail application and Opera Browser. cover to any of the applications installed in the Zaurus. Sets the current date, time and city. from a CF or SD/MMC memory card. Displays information about the systems status. connecting the Zaurus to the PC. Calendar, Todo List, and files by an infrared beam. card and a service plan. easily between the PC and the Zaurus. Qtopia Desktop for Zaurus Synchronizes the Zaurus with the PC for nonMicrosoft Outlook users. your PC. You cannot run both programs simultaneously. Opens the Address Book application. Opens/Switches to the Home screen. Opens or closes the pop-up menu. respective cursor keys you press. window (functions as same as the 7. Turns on for incoming e-mail messages. setting in the Calendar application. through the internal wireless LAN module. Enables connection of the AC adapter. Enables connection to the Docking Station. For entering characters and commands. host when it is connected. Attach an optional handstrap here. Rechargeable Lithium polymer battery pack. Switch when inserting/removing the battery. Used to tap the buttons etc. on the screen. For connecting an optional stereo headphone. turn this to face the IR port of the other unit. Turns the Zaurus on when it is off. Turns the Zaurus off when it is on. adapter (EA-70) for the Docking Station. Enable connection to the USB port. in the Zaurus, it takes approximately 7 seconds. Operation Manual of the CD-ROM. When carrying the Zaurus, be sure to close the cover to protect the LCD display. If not closed, the display may become damaged or broken. Push upwards to remove the cover. Push downwards to attach the cover. To open the keyboard, hold the sliding cover firmly and pull it down until it is locked. To close the keyboard, push it upwards until it is locked. Zaurus with the sliding cover open may cause damage. prior to press the keys in the sliding cover. 1. Connect the AC power cord to the AC adapter. 2. Plug the AC adapter connector into the Docking Station. Zaurus in the Docking Station by sliding it in. Note: Make sure that the unit is fully inserted into the Docking Station. PORT cover with the protruding part on the bottom. connector from the Docking Station. (PC link). It is not used for charging. Docking Station may become damaged. Using the Docking Station, you can connect to a PC and exchange files and data. Refer to the PC operation manual for more information regarding connections. 1. Connect the USB connector of the Docking Station to the USB port of the PC. Station” above to connect the AC adapter and Zaurus to the Docking Station. • Before step 1, be sure to turn the PC power on. the cable from the PC. • While communicating with the PC, the AC adapter must be connected. for 30 seconds before replacing it on the Docking Station. properly recognized as a USB device. • Do not remove and re-connect the USB cable from/to the PC in a short time. Every time you press the Back light key , the back light will turn on and off. Zaurus for a certain period of time. time that elapses before the back light will turn off automatically. unit for a certain period of time. the time that elapses before the unit turns off automatically. item (buttons, etc.) on the screen using the stylus. operations are included, if they make it easier to carry out the relative function. Touch an item (application icon, button, etc.) on the screen once to execute it. For example, drag to select the characters you wish to copy. Press the cursor key ( ) to move the focus. window, or press Cancel key to close it without saving the settings. Press the Home key to display the Home screen. There are following Home screens. screens, and then tap the desired icon to start it. Applications: consisting of built-in applications. consisting of built-in sample Java applications. accessing applications in the list view. or Suspend (power off), etc. Tap to display the input modes (see page 64). Tap to pop up a list of input methods. depending on the condition of the Taskbar). Note: Multiple applications may run simultaneously. displayed that shows the signal strength level. Tap to get the battery’s status (see page 75). explanations, see “Reorganizing Your Files” (page 39). in either the Internal Flash or the memory card will be displayed. Install_Files .............. This folder is used when installing software. Text_Files ................. Contains Text files created with the Text Editor. SD Card ............................... Displayed when an SD memory card is installed. Install_Files ... This folder is used when installing software. CF Card ............................... Displayed when a CompactFlash card is installed. contained within will be displayed. and the file will open. related data in a single folder (see page 40). You can reorganize your files using folders in the File Home screen. This section explains how to view files created using the Imaging application. 1. Tap the Folder menu on the Files Home screen. 4. Tap the file you wish to view. The Imaging application will start and the file will open. of the Cancel key on the Files Home screen (see page 43). This section describes how to create a new folder within the “Internal Flash” folder. 1. Open the “Internal Flash” folder on the Files Home screen. 2. Tap the New Folder button. The new folder creation screen will be displayed. A new folder will be displayed under the “Internal Flash” folder. This section describes how to move the Imaging file to the new folder created above. Open the “Image_Files” folder, and select the file you wish to move. Tap the “Edit” menu (or tap and hold the file) and then tap “Cut” or “Copy”. Tap the “Edit” menu and then tap “Paste”. 1. Select the folder or file you wish to rename on the Files Home screen. 2. Tap the “File” menu (or tap and hold the folder or file) and then tap “Rename”. The Rename screen will be displayed. 1. Select the file for which you want to change the date. 2. Tap the “File” menu (or tap and hold the file) and then tap “Change date”. 3. On the mini-calendar that will appear, select a new date for the file. 1. Tap the “View” menu and then tap “List”. The index display will change to a list view. You can change the items that are shown when using the list view. 1. Tap the “View” menu and then tap “List View Settings”. The list view settings screen will be displayed. 2. Tap the Item button, and select the item name for each item you wish to display. 2. Select “Set as wallpaper”. The selected image file will be set as the wallpaper. 1. On the Files Home screen, tap and hold any Image file. 2. Select “Clear wallpaper settings”. The current wallpaper will be cleared. 1. On the Files Home screen, tap the “View” menu and then tap “Preferences”. The Preference screen will be displayed. When a file is open, the application and file will be closed. the application and file will be closed. be made on the PC. entered from the keyboard (For example, *, /.). are case-independent on an expansion memory card. Creates a new folder (see page 40). similar device using infrared transmission. Changes the name of a file or folder (see page 41). Changes the date information of the file. Displays the folder which was previously viewed. Pastes cut or copied files or folders. Switches to the list view index screen (see page 41). index screen is displayed (see page 41). 1. Display the Applications Home screen. 2. Tap the “Todo List” application icon to start the application. menu, and release your stylus on the application to start. at the upper right of the screen to close the application. memory may cause the launch time to slow down. not be as fast as subsequent times. resumed. If you change the ordering of the list again, tap column buttons. 1. Start the Todo List application. The Index screen will be displayed and the entries can be viewed in list form. 2. Press the Up or Down cursor key to move the focus to the desired entry. 3. Press the OK key. The Detail screen of the entry will be displayed. Tapping an entry in the Index screen will also display the Detail screen. Note: For data intensive applications, the screen might display slowly. in the upper right to close the Detail screen. The display will return to the Index screen. items on the Menu bar will vary depending on the application. 1. Press the Menu key or tap the desired menu command. Note: Pressing the Menu key again will close the menu. command, then press the SELECT key to execute it. You can also tap the desired menu to select it. is displayed on the right edge of the menu, a sub-menu exists. open another window or screen. etc.) are enclosed by a dotted line. The focus will move within the allotted area (entries list, menu bar, tab, etc.). cursor keys will move the focus within the Menu bar, and not to the entries list. Index screen, press the Tab key to move the focus to the entries list. Some of them are indicated in the shortcut icon format on the Menu bar. Refer to the “Categorizing Entries” for details about Categories (see page 55). The new entry screen for the selected application will be displayed. 2. Select and enter the required items. See the following pages for details about making entries. or press the OK key to save the setting. 1. On the Index screen, select an entry you want to modify. 2. Tap the Edit icon ( ). The Edit screen will be displayed. key to save the modifications. Drag the text to select it. To move the text, tap “Cut” on the “Edit” menu, or tap “Copy” to copy the text. Move the cursor to the destination for moving or copying the text. Tap “Paste” on the “Edit” menu. The text will be pasted in the new location. When entering or editing data, some items are selected from lists. Tap the drop-down list button and select from the list. Tap and select from the list, or enter information directly. , or enter numbers directly. 1. Tap the drop-down list button and select from the displayed list. at the right edge of the field to change the number. You can also tap the entry field and enter a number directly. 1. Tap a checkbox to place a checkmark there. 2. Tap again to remove the checkmark. Radio buttons are used to select a single item from multiple options. 1. Tap the radio button to select. 1. Display the New Entry screen or the Edit screen. 2. Tap the Category drop-down list button. The Drop-down list will be displayed. 3. Tap the desired category to select. 2. Tap the Edit Categories button ( ). The Edit Categories screen will be displayed. 3. Tap the “Add” button. The Add screen will appear for entering a new category name. screen. To add additional categories, repeat steps 3 and 4.
name and then tap the “Rename” button. delete will be automatically reassigned to the “Unfiled” category). • You cannot duplicate an existing category name. the added category will be displayed in the list. • To view the entries of a specified category, see page 58.
category checkbox. Multiple categories can be selected. categories, “(Multi. )” will appear in the Category name field. only the entries that are assigned to a specified category. 1. On the Index screen, tap the “Category” menu. If “More...” is displayed, skip to step 1 below. 2. Tap the category you want to display. title bar of the Index screen. Choose the “All” category to show entries in any category. The Select category screen will appear. 2. Tap the drop-down list button. All category names will appear in alphabetical order. selected category will be displayed on the Index screen. entries of a specified category in the Calendar application itself. 1. On the Index screen, select an entry you want to delete. The confirmation message will be displayed. will allow you to perform the delete function. 3. Tap “Yes” to delete it. The selected entry will be deleted. 1. Tap the “Data” menu and then tap “Delete all” in the desired application. 2. Tap “Yes” to delete them. All entries in the application will be deleted. 1. On the Index screen, select an entry you want to duplicate. 2. Tap the “Data” menu and then tap “Duplicate”. The selected entry will be duplicated. 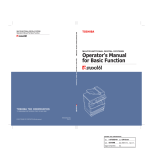 Receive” in the Operation Manual on the CD-ROM. You can change the display font size in the application for easier viewing. 1. Tap the “Option” menu and then tap “Font”. The current display font size will be checked. 2. Tap the desired font size. Note: The selected font size will only apply to the current application. 1. On the Index or Detail screen, tap the “Option” menu and then tap “Find”. The Find screen will appear. will be able to move it. Operation Manual on the CD-ROM. “Find Prev” to search the previous part of the entries. The search result will appear. the entries to be displayed. to close the Find screen. Using these tools, you can type in letters, numbers and special characters. letters when the Caps lock key is active. upper left characters in number keys (such as @ and?). Deletes the character to the left of the cursor. Executes the current operation or starts a new line. Opens the symbol window for entry of special characters. Deletes the character to the right of the cursor. Scrolls pages on some screens. Typing text is simple and straightforward. Press a key to enter the corresponding letter. To enter a lowercase letter “h”, press . , and then press the number key, or put it in the Num lock mode. If you make a mistake while entering text, you can delete the text as follows. 1. Move the cursor to the right of the character to be deleted. to delete a character to the left of the cursor. ” will appear at the bottom left of the screen. Handwriting, Keyboard, Pickboard and Unicode. Tap the input method you prefer. The icon will change to reflect your choice. ): Enters characters using your handwriting. Pop up the input area in the handwriting mode. Write a letter with the stylus. input area). Tap it to enter it. To insert commands other than characters, make handwriting gestures. “Return”, “BackSpace”, “Uppercase”, and “CapsLock”. the Handwriting Help (see page 66), and you can learn how they are drawn. The Tips screen will show you hints of how to use handwriting effectively. character types. Then, tap any character in the Character list. button, the corresponding lowercase letter will be demonstrated, if available. handwriting on the right Input area. characters to the character you wrote. You can customize the handwriting input area. If you start after the specified time, it will be recognized as a second character. You can customize the input area shown in the handwriting mode (see below). “Upper and lower case areas” by tapping the radio button. the uppercase character and then write the desired character (in lowercase). This setting will allow you to customize the handwriting to your own style of writing. (Trainer screen in the Handwriting Help). The input area shows the corresponding character selected in the character list. This demonstrates the way the Zaurus recognizes the character. Tap your choice from the character list. Tap the “Clear” button when the character is displayed. Write the character in your own style. Tap the “Add” button to add your writing. button. To revert to the default setting, tap the “Default” button. handwriting gestures can be selected instead of entering characters. 1. Tap the “Clear” to clear the character displayed on the input area. 2. Write the desired character in the input area. The Enter new character screen will be displayed. 4. Type a character you want to register using the hardware keyboard. If you want to add command words, tap the Character combobox button. on the Enter new character screen to add it. on the Setup Handwriting Input screen to save your writing. [Caps Lock], [Shortcut], [Punctuation], [Symbol], and [Extended]. Pull up the keyboard mode in the input area. instead of typing on them. Tap the desired character to insert it. If you tap Shift, it will remain down until you tap it again or tap a letter. and hidden every time you tap it. The Pickboard will provide fast text input using a minimum amount of screen space. Pull up the pickboard mode in the input area. move to a new line. CAPS LOCK is controlled by tapping “Shift”. The KEY group leads to a set of keyboard navigation keys, e.g. PgUp, PgDn, etc. To return to the normal Pickboard, tap the pop-up menu button and then tap “Reset”. on the numbers in the top line for them to be entered. To display symbols, tap “@*!?”. To display special characters or commands, tap a letter “KEY”. Tapping letter groups will enter words. The Pickboard will present a list of letters and words at the top of the input area. If the word you intend to type appears, tap it to insert it. JKL group (for “l”). At this point the word “hotel” will appear; tap the word to enter it. option and a Reset option. Use this menu if you were not able to find your word. pop-up menu button and tap “Add...”. This will pop up the Add dialog which will present a list of letters. key-top indication will switch between upper and lower case. Use Unicode mode to insert special characters and symbols. Unicode characters are collected in groups. To insert a character, tap it in the grid. The Sound volume icon will always appear on the taskbar. 2. Tap and hold the slider and move up or down to adjust the volume. If you want to mute all sounds, tap the “Mute” checkbox. setting and close the window. stereo headphone including alarms, keyclicks and screentaps. 1. Tap the Battery icon on the taskbar to check the battery level. The Battery Status screen will appear. the AC adapter is disconnected, “External power disconnected” will be displayed. You can use a CompactFlash card, an SD memory card or a Multi Media Card. folders will appear in the Files Home screen. The data in the Internal Flash can be backed up and restored using a memory card. 1. Be sure to turn the Zaurus on before inserting the card. (the keyboard and other function keys will be fully operational). Be sure to insert the card in the correct direction and orientation. The memory card folders will appear in the Files Home screen. • Do not subject the card to strong electrical shocks. 1. Be sure all applications are closed before removing the card. 2. While the card is inserted, tap the CF (or SD) card icon on the taskbar. The pop-up menu will appear. 3. Tap “Eject CF card” (or “Eject SD-card”). The CF (or SD) card icon will disappear. Now you are ready to remove the card from the CF (or SD) card slot. 4. After the CF (or SD) icon disappears, remove the CF card straight out. open, or if a modem card, etc. is in use. change the storing destination to the Zaurus then eject the CF card or the SD card. properly, and this may result in incorrect operation. The data on the card may also be corrupted. • Use your fingers to prevent the card from popping out from the SD card slot. The Help Browser is a hyperlinked help system that works similar to a Web browser. 1. In the Applications Home screen, tap the “Help Browser” application icon. The top screen will be displayed. 2. Tap the blue word to jump to the page concerning the word. screen of the Help Browser (not available for all applications). for the application help screen. Adds the page to the bookmarks. By registering frequently-used pages, you can easily jump to the page. 1. Display the Help Browser page you want to register to the bookmarks. 2. Tap the “Bookmarks” menu and then tap “Add Bookmark”. The title of the page will be registered. The bookmarked page will be displayed. 2. Tap the “Bookmarks” menu and then tap “Remove from Bookmarks”. The bookmark of the page you are on will be removed from bookmarks. Step1: Transfer the application installation file from the CD-ROM to the Zaurus. Insert the CD-ROM into your CD-ROM drive. Step2: The software installation process will be executed on the Zaurus. according to the instructions that start on page 15.
and do not disconnect the cable from the PC. • When communicating with the PC, the AC adapter must be connected. approximately 30 seconds, then turn the power on again. menu by ejecting the CD-ROM, then reinserting it. 5. Click “Additional Software for the Zaurus”. A window will open, displaying the Applications folder on the CD-ROM. 6. Next, display the Zaurus memory window. Zaurus File Transfer → Zaurus File Transfer. The Zaurus File Transfer application window will appear on the desktop. The “Internal Flash” folder displays the internal flash memory of the Zaurus. When a memory card is installed, an “SD Card” or “CF Card” folder will appear. 7. Double-click the “Internal Flash” folder, then double-click “Install_Files” folder. “Install_Files” folder of the Zaurus. The file will be transferred into the Zaurus memory. then continue with the following steps. Install the software you copied onto the Zaurus for use with the Add/Remove Software application. 1. Turn on the power to the Zaurus and display the Settings Home screen. A list of software copied to the Zaurus will be displayed. 3. Tap the software to be installed. A screen for selecting the software installation destination will be displayed. 4. Tap “Internal Flash” to select it. 6. Tap “OK” on the confirmation screen. The display will return to the screen in step 3.
sure to perform steps 7 and 8. The installation is not yet completed at this point. The display will return to the screen at the right in step 2.
to exit the Add/Remove Software application. After a few seconds, the Home screen will be displayed. The software is now ready for use. can be launched from there. details, see the Operation Manual on the CD-ROM. the “Troubleshooting Guide” included on the CD-ROM. When the error check is executed, corrupt files or data may be deleted if found. If the problem is not resolved by the steps above, execute “Format”. All data or added software will be deleted. 1. After saving any edited entry, close all applications. 2. Tap the Qt Menu icon ( ) on the taskbar and then select “Reboot”. 3. Tap “Yes” to reboot the Zaurus. date, then press the OK key. The Home screen will be displayed. will be lost by performing a reset (the stored data won’t be lost). 1. After saving any entry being edited, close all applications. Turn the Zaurus off and make sure that the screen has gone blank. power cannot be turned on/off, perform the next step. 2. Press the reset switch with the supplied stylus pen. 3. Turn the Zaurus on. The Set System Time screen will be displayed after a few minutes. Adjust the time and date, then press the OK key. 3. Release the Rec and POWER keys. 4. Turn the Zaurus on. Caution: Be careful not to drop the Zaurus when resetting. Note: Repeat from step 1 if resetting can not be performed. System” for instructions and precautions. and your files or entries may be lost. Zaurus system maintenance can be performed from the Maintenance menu. 1. After saving an edited entry, close all applications. 2. Be sure to attach the AC adapter. Make sure that the charge light will turn on. 3. Press the reset switch with the supplied stylus pen. 4. Press the POWER key while holding the OK key. Note: Repeat from step 1 if the Maintenance menu is not displayed. continues even after a Reset operation (see page 85). and then re-formats the memory. software you have added will be deleted. memory and EMail data in the memory card. be deleted, and your files, entries, data or settings may be lost. 1. Display the Maintenance menu (see page 87). to select “2. Error check”. The Error Check screen will be displayed. 3. Read the displayed information, then select “Yes” and press the OK key. The Format screen will be displayed. The Format operation will begin. the initial settings (see page 11 to 14). observed, the memory contents may be changed or lost. • Only use the “EA-BL09” rechargeable battery. 1. Turn the Zaurus off. 3. Remove the discharged battery. battery are aligned correctly with those printed inside the battery compartment. battery replacement switches to the “ ” position. If the battery is not charged, charge with the supplied AC adapter. 6. Press the POWER key to turn on the Zaurus. If the Zaurus does not turn on, try again from step 1. 7. Check the time and date. conditions and in accordance with the following instructions. repaired by authorized service personnel. when a partially ejected communications or other card is in the Zaurus. Malfunction or damage may occur to the card or the Zaurus. pressing the display or keys. broken, or damaged when you carry it with other objects. • Do not use sharp, pointed objects or your fingernails to touch the display screen. thinner, benzene, or wet cloths. They may cause deterioration or color changes. • Do not carry your Zaurus in your back pocket as it could break when you sit down. The Display is made of glass and is particularly fragile. strap very tightly. Doing so may result in damage or faulty operation. • The Zaurus consumes battery power even when turned off. • Before removing the battery from the Zaurus, make sure the Zaurus is turned off. RECYCLING AND DISPOSAL PLANS IN YOUR AREA. caused by the use of other batteries, AC adapters, or accessories. you also keep separate written copies of all important data. unit in the same position during operation, you may suffer low-temperature burns. If the following precautions are not observed, fire or electric shock may occur. • Only use the “EA-70” AC adapter and the recommended AC power cord. • Do not use voltages beyond the indicated power supply voltage range. outlet and from the unit for safety. • Do not perform modifications, disassembly, or repair. • Do not connect or disconnect the AC adapter with wet hands. — In case of damage. — When there is smoke or a strange smell. — When an abnormal sound is heard. • The AC plug must be appropriate for the AC outlet configuration. • Only use the AC adapter and AC power cord indoors. • Do not keep the AC adapter and AC power cord in places that are very dusty. them in places where they can fall from a high level. • When charging, be sure to use the Zaurus only with the “EA-70” AC adapter. • Also keep the battery away from open flames. • Never attempt to disassemble the battery pack. • Do not drop or subject the battery to shock. • Charge the battery properly, according to the details described in this guide. injury. Should this occur, wash with clean water and immediately consult a doctor. immediately wash with clean water. ears could be injured by unexpectedly loud sounds. • Never use the accompanying CD-ROM in an ordinary audio CD player. If you have a problem with your Zaurus, check the following points. If the problem remains, contact our Support center. I want to know how to turn the back light on. Operation Manual: “Managing power (Light & Power)”). The charge light blinks or will not turn on. the charge light will turn off. Tap the battery icon to check the battery status. • Make sure that the supplied “EA-70” AC adapter is used and connected correctly. Disconnect the AC adapter and then connect it again. is set to the “ ” (see page 8). The Zaurus does not turn on even after recharging. charging time has elapsed since the charging began. recharge the battery (see page 90). • Charge at the specified temperature range: 5°C to 35°C (41°F to 95°F). the battery may discharge and charging may restart. The Zaurus turns off by itself. battery status. Charge the battery, if it is low. The Zaurus does not turn on by pressing the POWER key. The screen is lit but characters, etc. are not displayed. Tapping or operating keys will not work properly. • Try to change the displayed contents by pressing the Home key, etc. is set to the “ ”. • Perform the Reboot/ Reset/ Error check operations in this order (see page 84). I forgot my Security passcode, and I cannot operate my Zaurus. added to the Zaurus (see page 89). adapter is used or during charging. A rainbow pattern is appearing on the screen. Application start up is slow. on the screen displayed. This will consume more memory (see page 46). Entries in the Calendar application, etc. cannot be deleted. Todo List, EMail, and Text Editor (in the Notes tab) applications may not be deleted. tab) applications or unnecessary files displayed on the Files Home screen. A memory shortage is occurring when starting up applications. • If some applications have already been opened, close the unnecessary ones. • Try to perform the Reboot/Reset/Error check operation in this order (see page 84). Entries I have saved are not being displayed on the Index screens. category will be displayed. Select “All” under the “Category” section (see page 55). Index screen and make the highlight active. The characters are small and I want to make them bigger. menu in the Address Book, Calendar, Todo List, Text Editor, or EMail application. the “File” menu then select the new date on the mini-calendar (see page 41). I have set a scheduled alarm but the alarm does not make a sound. sounds will be heard through the headphone. checkbox on (see page 74). sound (See the Operation Manual on the CD-ROM: “Calendar”). The CF or SD/MMC card is not being recognized properly. The CF or SD card icon does not appear on the taskbar. • Turn the power off and on again. • See page 76 and be sure to remove the card and insert it again correctly. not work properly with the unit. tapping the icon and the tapping “Eject card” (or “Eject SD-card”). closing all applications and turning off the Zaurus. IR communication is not possible. entered on the receiving unit? card) connected, after the rechargeable battery (EA-BL09) is fully charged. • Battery power is consumed even when the power of the Zaurus is turned off. Zaurus is not being used. Please recharge during this time. Note: The Battery life may vary depending on the usage. further product support, you can contact us using the information below. Prior to contacting us, please have the following information available. • The serial number of your Zaurus (indicated on the back of the unit). website or contact us at the e-mail address listed below. and provide proof of purchase to the servicer. consequential damages, so the above exclusion may not apply to you. labor from date of purchase. For the Rechargeable Battery: Ninety (90) days from date of purchase. Product are excluded from warranty coverage.